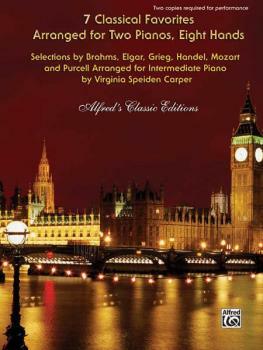 The 7 Classical favorites in this collection have been masterfully arranged for two pianos, eight hands. Titles: Allegro Deciso from Water Music * German Dance (K. 605, No. 3) * Pomp and Circumstance (Military March No. 1 in D) * St. Anthony Chorale from Brahms' Variations on a Theme by Haydn * Triumphal March from Sigurd Jorsalfar * Two Handel Minuets from Music for the Royal Fireworks * Two Trumpet Voluntaries. 2 copies are required for performance. 116 pages. "Two Handel Minuets from Music for the Royal Fireworks" is a Federation Festivals 2014-2016 selection.